The R racemate of LOXO-195, a potent, selective, next-generation Trk tyrosine kinase inhibitor with IC50 of 0.6 nM and <2.5 nM for WT TrkA and WT TrKC, respectively. The RS-isomer of LOXO-195, a potent, selective, next-generation Trk tyrosine kinase inhibitor with IC50 of 0.6 nM and <2.5 nM for WT TrkA and WT TrKC, respectively. 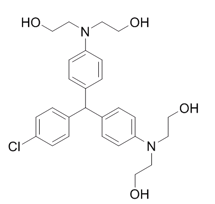 PD90780 is a nonpeptide inhibitor of NGF binding to p75NTR (IC50 ~ 1 μM in CHO cells); binds NGF, not p75NTR. AZ-23 is a potent and selective tyrosine kinase (Trk) inhibitor having potential for therapeutic utility in neuroblastoma and multiple other cancers. 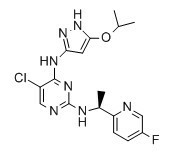 PF-06273340 is a potent, selective, and peripherally restricted Pan-Trk Inhibitor with an excellent LipE profile (IC50 value: Trk-A = 6 nM; Trk-B = 4 nM; Trk-C = 3 nM). Larotrectinib, also known as ARRY-470 and LOXO-101, is an orally bioavailable, potent, ATP-competitive inhibitor of TRKA, TRKB, and TRKC. Tavilermide is a nerve growth factor mimetic.